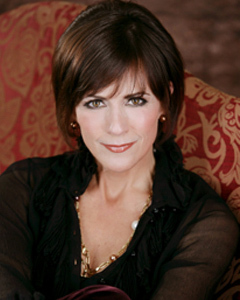 Colleen Zenk is best known to millions of fans as Barbara Ryan on the daytime drama As the World Turns, a role she played for 32 years and for which she earned three Emmy Award nominations. Zenk’s affinity to be on stage began as a child in Barrington, IL where she enrolled in dance classes at age three and by age nine was working professionally. She soon landed regional musical theatre roles, working as a commercial and fashion model, and training in Chicago as a dancer. She studied theatre at The Catholic University of America and then headed to New York. During her years on As the World Turns, she continued to pursue her love for musical theatre and made her Broadway debut as Rosie in Bring Back Birdie, opposite Chita Rivera and Donald O’Connor, and her film debut in John Huston’s adaptation of the Broadway musical Annie. She has also had starring roles in They’re Playing Our Song, Where’s Charley, Can Can, The Star-Spangled Girl, and Barefoot in the Park. Most recently she has been busy with her one woman show Still Sassy. An oral cancer survivor, Colleen has teamed with the Oral Cancer Foundation to bring increased awareness to the disease. Her top priority and favorite role of all, however, is that of mother to a blended family of six children, and she credits this close-knit support system with sustaining her in every possible way.